Tilting trains? It might sound strange, but Amtrak's new Acela line trains that lean into curves and bends will shave time off trips, and they plan to roll them out over the next couple of years. Amtrak's Northeast Corridor is the busiest region in the Amtrak system, according to the agency, accounting for more than a third of total passengers. The Acela trains already offer quicker trips than Amtrak's regular equipment on the route, and soon they could become even faster. Caroline Decker, vice president of the Northeast Corridor service line, said Amtrak is doing everything it can to provide a premier experience for passengers. "Looking at every curve, every possibility where we can improve the trip time," she said. Top speed for the trains is now 150 mph. 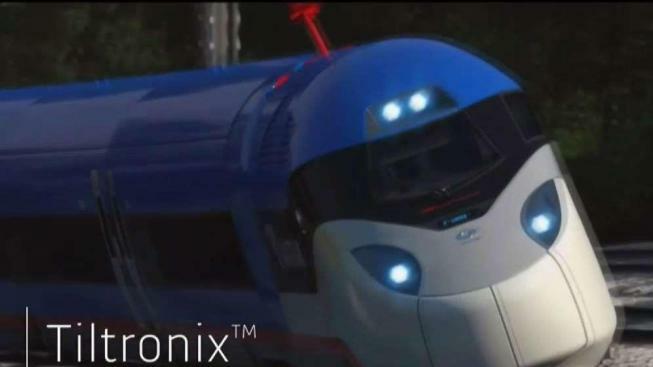 New trains could hit 160 mph. And while the current trains do tilt some, new trains would tilt more. In addition to the new, faster trains, Amtrak officials are exploring other service enhancements as well — including a nonstop trip between D.C. and New York that would take just two and a half hours, shaving about 16 to 22 minutes off the existing Acela trip. Since the new trains wouldn't replace existing equipment, that means the surplus trains could be used to offer departures every 30 minutes, or for express trips. High-speed rail is difficult to attain for many communities across the country. U.S. Transportation Secretary Elaine Chao said this is due in part to the geography of existing rail lines. "You need a straight right-of-way in order to pick up speed, and so for many of our communities who are clustered around the path of the tracks, it's difficult for [trains]" Chao said. These new trains aren't all that's being proposed. Amtrak's second-century plan involves major renovations to the Union Station passenger area. The improvements are intended to triple passenger capacity and double train capacity at the station. During the construction, the passenger area of Union Station will still be in service. Passengers have reason to hope that within the next couple of years, their trip north from Union Station will become that much speedier. CORRECTION (Feb. 26, 12:43 p.m.): An earlier version of this story incorrectly stated the two-and-a-half hour trip would be between D.C. and Boston, not D.C. and New York.